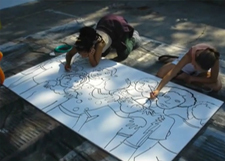 Club Nova members helped design and paint outdoor murals. All the air conditioning ducts under the house were repaired and new thermostats were installed. Weather stripping was installed around the doors. The front of the house was scraped and painted as was the side and rear entrances.The porches and wooden furniture were painted. New rails were built around the front porch and were primed and painted. The trees were pruned. With the help of a bobcat, a dump truck load of soil and mulch. The front and side of the house was landscaped and shrubs and flowers were planted. Club Nova and the community were amazed and grateful for the hard work and inspiration of this powerful leadership team!Budget: $30,000. Club Nova members, volunteers and community members gathered last week to celebrate the renovation of the clubhouse earlier this month. Over one weekend, more than 80 volunteers spent 26 hours completing the renovations. 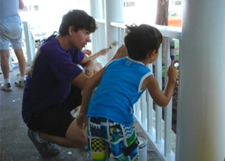 They improved the clubhouse’s energy efficiency, repaired and painted three exterior porches, trimmed tree branches, installed flowerbeds and restored the wooden chairs and picnic tables used by clubhouse members. 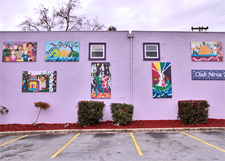 The volunteers also installed a six-panel mural based on designs created by Club Nova members on the exterior wall of the Club Nova Thrift Shop. “The bigger thing is that it’s a new day for Nova,” said Carl Tatum, project captain. For organizations like Club Nova to succeed, he said, communities have to step up. “Everyone in our community makes a difference, and nobody gets left behind,” Tatum said. 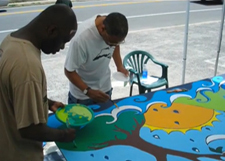 The project was led by the WorldLegacy’s NC119 Leadership Team, who chose Club Nova as their Extreme Makeover Legacy Project to support people with mental illness. The team created the project, organized the volunteer workforce and collected donations of funds and materials. Club Nova is one of 400 clubhouses internationally that provide employment and community for adults living with mental illness.